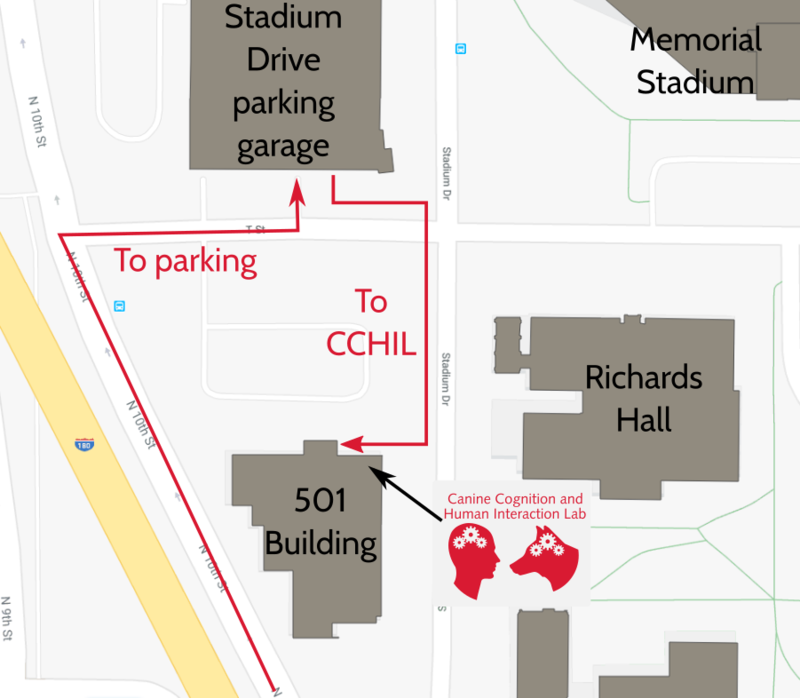 The Canine Cognition and Human Interaction Lab (C-CHIL) is in room 3 in the basement of the 501 Building on the University of Nebraska-Lincoln's city campus (501 Stadium Drive). From the north: take I-180 southbound until it turns into 9th Street, then turn left on P Street and left again on N. 10th Street. From the west, south, or east: come to the intersection of O Street and 10th Street and turn north onto N. 10th Street. Once heading north on N. 10th Street, stay in the right lane and turn right on T Street. Parking will be available at the Stadium Drive parking garage on T Street for $1.25 per hour. Walk south on Stadium Drive to enter the 501 Building. Once in the building, go downstairs, and C-CHIL is in the northeast corner of the building (closest to the parking garage) in room 3. C-CHIL is not open for drop-in visits, only for scheduled appointments.